GDC is over and, as always, more happened over that one week than any single person can keep track of. That's why we've put together this handy roundup of all the best biggest news and developments. To unionise or not to unionise? A survey carried out four years ago by the International Game Developers Association found that 56% of developers were in favour of unionising the industry. A panel at GDC entitled 'Union Now?' aimed to address this still lingering question. Following the discussion, IGDA president Jen MacLean said that elements of the games industry were "fundamentally broken". But speaking in an interview with GamesIndustry.biz, MacLean was skeptical about the prospect of unionising. After his interview with MacLean, our very own Brendan Sinclair made the case for a better industry advocate, arguing that "the IGDA is fine for what it is, but it is not an organization capable of representing the interests of game developers." 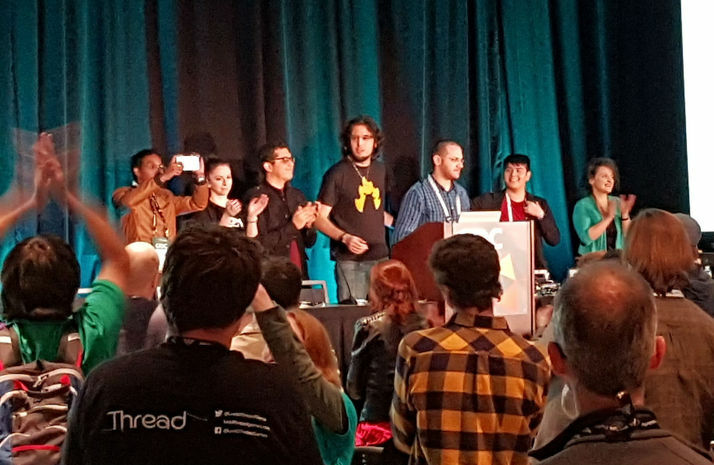 The #1ReasonToBe panel returned to GDC this year, chaired by Vlambeer's Rami Ismail. This year's panel explored burgeoning developer communities in Madagascar, the Philippines, Columbia, and beyond. Ismail argued the point that games development is truly global, but that GDC is almost exclusionary, made worse by how difficult it is for people to enter America under the Trump administration. Gwen Foster, of the Filipino game industry, was unable to attend GDC and speak at at the panel after having her visa entry denied. Writing for GamesIndustry.biz, Foster explored the "diplomatic hostility" in a global industry. It was a big week for artificial intelligence as EA's secretive Search for Extraordinary Experiences Division revealed a self-learning agent capable of playing Battlefield I. The revelation could reshape the immediate future of games design from QA testing to procedurally generated animation. SEED also revealed the advanced lighting techniques featured in Project Pica Pica, which EA described as a "playground for our self-learning agents". Meanwhile, at the AI Summit, Spirit AI's Emily Short focused on "Stupid Questions About AI", stressing the need for the public to understand what AI is and what it can do. Unity's annual keynote updated developers on forthcoming engine improvements such as the Scriptable Render Pipeline, and machine learning tools which can learn from real player habits and adjust based on their behaviour. Additionally, Unity introduced Templates to help support newer developers. Unity also announced a partnership with Universal Studios to run the Universal GameDev Challenge which vice president of marketing Katrina Strafford setaile . Developers have been challenged to create a new game concept based on one of five Universal-owned IPs: Back To The Future, Battlestar Galactica, Jaws, DreamWorks Voltron Legendary Defender and Turok. The winning studio will be rewarded with the opportunity to turn its game in a full product, plus it will receive $250,000 cash and a consulting contact with Universal. In other big news for Unity, The Sims creator Will Wright confirmed that he is working with the engine provider to find an artist for his first new games project in over a decade. The Cambridge Analytica scandal could not have come at a worse time for the social media giant. As Facebook tried to push its agenda on a new software development kit for PC, and announce that the Facebook Instant Games was leaving closed beta after 18 months, it was also desperately trying to mitigate the damage and crack down on "platform abuse". Epic Games demonstrated its new lifelike "digital humans" and showed how real-time raytracing could help games finally cross the uncanny valley. "Honestly, between five and ten years from now, I don't think you're going to be able to tell the difference between the real and the virtual world," CTO Kim Libreri told GamesIndustry.biz. Of course, when Epic Games isn't trying to create perfect digital lifeforms, it's taking over the world with Fortnite. Earlier this year Epic announced that it would be shutting down servers for its disastrous MOBA, Paragon to make room of the smash hit that is Fortnite. But the publisher went a step further during GDC, revealing that it would be making $12 million of Paragon assets available for free to all developers. Following the success of Fortnite on mobile, Epic Games CEO Tim Sweeney laid out a future where the barriers between consoles will no longer exist; one where mobile is not entirely dominated by casual games, but instead by "real games for gamers". "This has happened in Korea and in China over the last couple of years," he told GamesIndustry.biz. "And now, in a lot of the world, these real games for gamers are number one in revenue, number one in playtime, and they're really changing the shape of the games industry." However, the story of Fortnite is only half-told without the inclusion of PlayerUnknown's Battlegrounds which burst onto the scene months beforehand to capture the world's attention. PUBG Corporation community manager Sammie Kang explained during her talk that the "out of nowhere" success was the result of a months long guerrilla marketing campaign. ID@Xbox director Chris Charla spoke with GamesIndustry.biz to discuss the challenges facing indies in the modern console space, particularly around discoverability in an increasingly crowded market. ID@Xbox announced the release of its 300th title in 12 months, bringing the total up to 800 since the program launched in 2013. The first 500 took just over three years to arrive, but Microsoft has upped its output in more recent months. Sharing his own thoughts on the issues facing indie games, Spiderweb Software founder Jeff Vogel made the point that "innovation is not the only path" to success. "You must remember," he said. "That every single one of us stands on the shoulders of giants. I looked at what I liked to play and I copied it. That is my creative process." He implored other developers in the audience to find a creative process similarly personalised to their own needs. We got a rare peek behind the magician's cloth this GDC when Nintendo revealed a list of the Switch's best-selling eShop indie games. Of the top ten, only three were Nintendo exclusives, indicating that the Switch is a popular choice for multi-platform titles. Ark: Survival Evolved is latest big multi-platform title headed for the Switch. The port from Abstraction Games impressed developer Studio Wildcard so much that it debuted on stage at GDC during the Unreal keynote talk. Speaking with GamesIndustry.biz, Abstraction CEO Ralph Egas went into detail about how his team managed to create such a stable build in a matter of weeks, and dispelled some of the myths around the Switch hardware. In other news, Ratchet & Clank director Brian Allgeier gave a talk on the iconic series 15-year survival and eternal mantra, "don't get cocky". Dating right back to 2001 when the game was still codenamed 'girl with a stick' right through to the 2016 Ratchet & Clank re-imagining, Allgeier detailed its many iterations, missteps, and successes over the years. 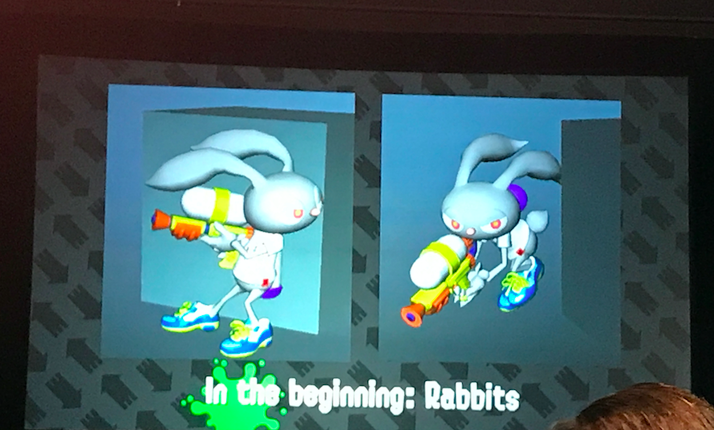 The history of Splatoon also got some air time at GDC this year as Hisashi Nogami took to the stage to discuss the birth of the series, back when to when the squid kids were just rabbits. Sergey Galyonkin of SteamSpy revealed that the top 100 games on Steam accounted for 50% of the platform's sales revenue in 2017. With the exclusion of DLC, in-app purchases, and microtransactions, Galyonkin estimated the sales revenue generated through Steam to be $4.3 billion in 2017. Valve chose GDC to make two announcements regarding its virtual reality endeavours. First was the HTC Vive Pro reveal, priced at $799. The high-end headset is by far the most expensive on the market and is clearly geared toward the cash-rich tech enthusiast. On the other end of the spectrum, it was revealed that the previously China-exclusive mobile VR headset - the Vive Focus - is coming to western markets, and that developer kits are already available. With the esports diversity question stilling hanging awkwardly in the air, a renewed focus has been placed on what developers of competitive online games can do to foster positive communities. Kimberly Voll, a senior technical designer at Riot Games, detailed the developer's new recipe for sportsmanship in League of Legends and how the old system was completely overhauled. Meanwhile Xbox, Twitch, Blizzard, Riot and more announced the Fair Play Alliance to combat toxic players. There are more than 30 companies already signed up to take part in the Alliance's combined efforts, who's mission statement is to work towards a "world where games are free of harassment, discrimination and abuse".